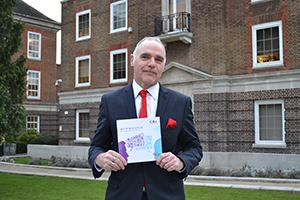 Middlesex University and CBI have jointly launched a report on the importance of business and university collaboration. Best of Both worlds: Guide to business-university collaboration was unveiled on Tuesday 27 January at Arup Headquarters in central London, and saw academics from universities across the country come together with over a hundred business leaders from small, medium and large enterprises, to hear the benefits of effective collaborative working. More and more businesses of all sizes are benefiting from partnerships with universities for research, innovation, skills and professional development, but the landscape is still confusing for some, which can be an obstacle to further progress. The guide provides advice, information and examples of different kinds of successful partnerships to help businesses develop collaborative relationships with universities in support of their research and innovation work or for enhancing the skills of current and future employees. Middlesex University has a rich history of working closely with businesses and when asked by CBI to collaborate on a guide for businesses and other universities, David Williams, Director for Corporate Engagement, explains how the University was the perfect fit. He said: "We have a proud record of work based learning, and have developed a number of successful initiatives and programmes for businesses including Wal-Mart's Asda, which has seen two brand new undergraduate degree programmes established to train staff. "Our partnership with Halifax has also seen over 1000 staff taking an in-house programme, not only accrediting staff with an advance diploma and postgraduate certificate, but providing customer confidence that advice being offered is from qualified professionals." Middlesex has a variety of business partnerships under its belt, with case studies ranging from SAP Enterprise Software, where a tailored MSc in Sales Transformation has been developed, to Hackney Children's Services, providing professionally qualified staff the opportunity to build on their existing skills and knowledge in training sessions. Professor Michael Driscoll, Vice-Chancellor of Middlesex University, said: "We have seen first-hand at Middlesex University the mutual advantages of working closely with businesses. Our partnerships with businesses from various sectors continue to grow and have seen staff becoming reskilled, creating home grown talent, and opening more doors for future company leaders. "Universities play a huge part in our country's research, with ground-breaking discoveries being uncovered every day. From developing bespoke programmes to providing expertise and support, Middlesex university has the knowledge and capabilities to nurture business confidence and address industry needs." Speaking after the event, Neil Carberry, CBI Director for Employment and Skills policy, said: "The UK's universities are a leading light with world-beating research skills and facilities that punch above their weight. In an ever more competitive global economy, we must strain every sinew to get the most out of this competitive advantage. "While many larger companies already recognise the value of such tie-ups, it is vital to make our growing, ambitious firms more aware of the opportunities on offer. This could ultimately help them to expand and boost jobs, and even create new industries through product innovation. "Businesses and universities with the foresight to share their skills and resources can work together and win together. Firms can reduce research and development costs and develop staff skills while universities can generate new ideas to train students and get a greater awareness of the needs of the marketplace."